Introduction: There is active interest in leveraging host immune responses as biomarkers of tuberculosis (TB) disease activity. We had previously evaluated an immunodiagnostic test called the antibody in lymphocyte supernatant (ALS) assay. Here, we aimed to evaluate a panel of inflammatory mediators and associate the responses with the ALS results to identify a biosignature to distinguish TB cases from controls. Methodology: In this case–control study, adults with TB were compared to controls who were hospitalized for non-infectious conditions. Blood was collected at baseline and after 4 weeks of TB treatment (from TB cases only). Peripheral blood mononuclear cells were isolated and cultured without antigenic stimulation for 72 hours. Inflammatory mediators were measured using the Multiplex cytokine kit and compared between TB cases and controls; among TB cases, responses were compared over time. ALS and inflammatory mediator results were evaluated using generalized discriminant analysis to identify the optimal biosignature to predict TB. Results: When comparing inflammatory mediators between groups, IL-1ra, IL-1β, and granulocyte macrophage-colony stimulating factor (GM-CSF) were lower in TB cases (P<0.002). Fibroblast growth factor-basic significantly increased from baseline to week-4 (P=0.002). 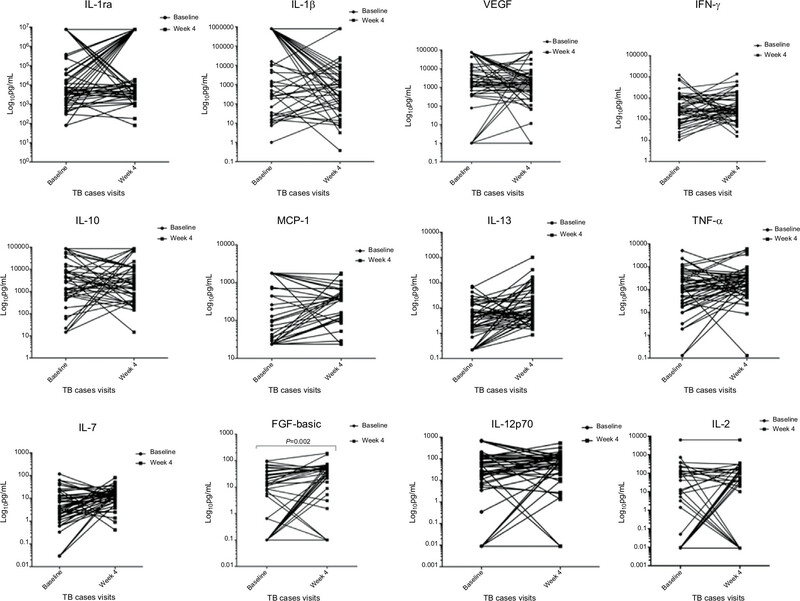 Generalized discriminant analysis yielded a model with IL-2, tumor necrosis factor-alpha, vascular endothelial growth factor, and ALS, providing a sensitivity of 82.2% and specificity of 76.2%. Conclusion: Our results suggest that IL-1ra, IL-1β, and GM-CSF might be used as diagnostic biomarkers to distinguish between TB cases and non-TB cases. We could not identify a group of mediators that outperformed the diagnostic accuracy of the ALS alone. Cytokines and chemokines are inflammatory mediators that are produced throughout the body by cells of diverse embryological origin.13 Upon encountering Mycobacterium tuberculosis (MTB) in the pulmonary alveoli, innate immune responses are triggered when antigen-presenting cells produce inflammatory mediators that work to coordinate early host immune defense mechanisms. These inflammatory mediators include pro-inflammatory cytokines such as tumor necrosis factor-alpha (TNF-α) and interferon-gamma (IFN-γ), cytokines such as IL-12 and IL-23 which through the priming and polarization of T-helper cells orchestrate important roles for granuloma assembly and anti-inflammatory cytokines such as IL-10 and transforming growth factor beta which have the ability to inhibit the synthesis of the major inflammatory mediators. Chemokines include CXCL-3 macrophage inflammatory protein ([MIP]-2β) and CXCL-5 (ENA-78) which are associated with recruitment of neutrophils and natural killer cells.14–17 Understanding the inflammatory mediators in the early course of TB may provide insight into the development of immunologic biomarkers of disease activity. Here, we present an evaluation of 24 cytokines, chemokines, and growth factors detected from unstimulated PBMC supernatants, with the aim of building upon the diagnostic accuracy of the ALS assay among our previously described cohort of adults from Tanzania with TB and TB/HIV.12 Also, we evaluate if these inflammatory mediators can be used as an early treatment-monitoring tool by comparing the difference between levels measured at baseline and 4 weeks after the initiation of TB treatment. This is a sub-study of our recent investigation of the ALS assay.12 Briefly, this was a case–control study conducted in the Kilimanjaro region of Tanzania in which adults initiating treatment for pulmonary TB were compared to hospitalized controls without TB. Adults presenting symptoms of pulmonary TB were recruited from Kibong’oto Infectious Disease Hospital, the national referral hospital for multi-drug resistant TB (MDR-TB) in Kilimanjaro, Tanzania. 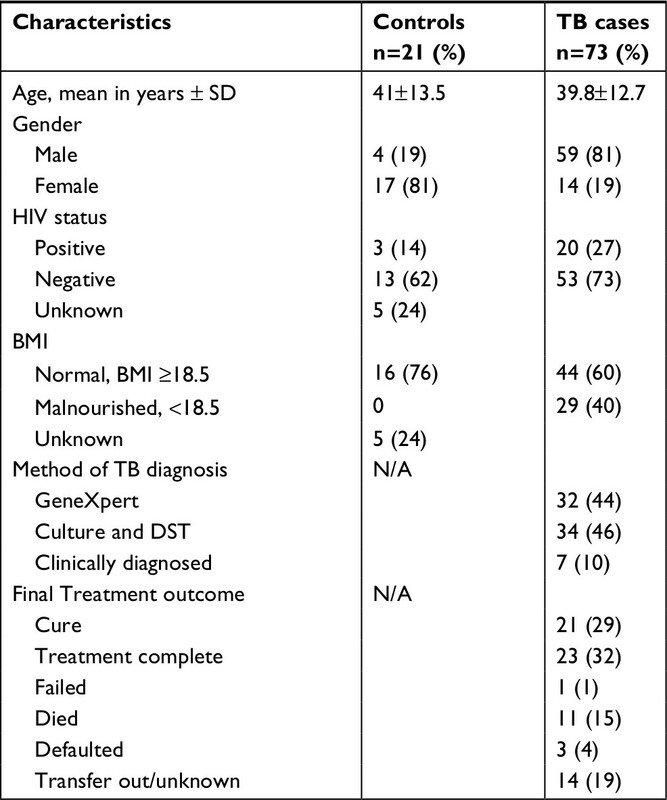 Eligibility criteria were as previously described.12 Briefly, “confirmed TB cases” included people with MTB detected from sputum by GeneXpert MTB/RIF (Cepheid, Sunnyvale, CA, USA)18 or by TB culture; “clinically diagnosed cases” included those who did not have a microbiological diagnosis, but were initiated on TB treatment based on clinical grounds and responded to therapy. All cases were treated with first- or second-line anti-TB drugs according to their drug-sensitivity profiles and national guidelines by the physician treating them.19 Blood samples were collected at baseline and at 4 weeks after the initiation of TB therapy. Adults who were hospitalized due to non-infectious conditions such as diabetes, hypertension, abdominal pain, and gastrointestinal bleeding were recruited as controls from Kilimanjaro Christian Medical Center Hospital, as previously described.12 Briefly, we verbally screened control participants to ensure that they had no current or prior treatment for TB, no signs or symptoms consistent with TB, and no prior contact with a known TB case; attempts were made to age-match controls with cases (±5 years). Cases and controls were included in this sub-study if they had sufficient PBMC supernatants available for analysis. As previously described, the ALS assay was conducted from the supernatants of PBMCs that were isolated and cultured without antigenic stimulation or any other cell receptor blockers for 72 hours to allow for maximum expression of all mediators.5,12,22 For protection against contamination, tissue cultures included the use of heat-inactivated bovine serum and L-glutamine; penicillin and streptomycin were also added to the culture media. Residual supernatants from the PBMC culture were frozen at −80°C with the protease inhibitor for batch analysis. The ALS assay was an ELISA based assay that used freeze-dried glutamate bacille Calmette–Guérin vaccine (Japan BCG Laboratories, Tokyo, Japan) as the coating antigen and captured IgG antibodies from the supernatant. Cytokines, chemokines, and growth factors from the supernatants were measured in duplicate using the Bio-Plex Pro Human Cytokine Multi-Plex, Group I kit (Bio-Rad Laboratories Inc., Hercules, CA, USA) according to the manufacturer’s instructions on the Luminex platform (Bio-Plex 200, Bio-Rad Laboratories Inc.).23 Briefly, the plate was pre-wet using 100μL of Bio-Plex assay buffer, and 50μL of diluted magnetic beads coupled with capture antibody were added. Then, 50μL of undiluted supernatant was added. Then, 50 µL of the supernatant was added without dilution. The secondary antibody was added after removal of unbound antigens and lastly, the conjugate was added. The beads were re-suspended using 125 µL of assay buffer. Analyte values were calculated based on standard curves as per the manufacturer’s instructions. Three mediators were excluded from the analysis because the majorities were out of range and re-analysis with dilutions could not be performed. The following inflammatory mediators met quality control procedures and were included in the analysis: IL-1β, IL-1receptor antagonist (IL-1ra), IL-2, IL-4, IL-5, IL-7, IL-8, IL-9, IL-10, IL-12p70, IL-13, IL-17A, eotaxin, fibroblast growth factor-basic (FGF-basic), granulocyte-colony stimulating factor (G-CSF), granulocyte macrophage-colony stimulating factor (GM-CSF), IFN-γ, inducible protein-10 (IP-10), monocyte chemoattractant protein-1 (MCP-1), macrophage inflammatory protein-1α (MIP-1α), monocyte inducible protein-1β (MIP-1β), platelet derived growth factor-bb (PDGF-bb), TNF-α, and vascular endothelial growth factor (VEGF). Ethical clearance was obtained from the National Institute for Medical Research, Kilimanjaro Christian Medical University College ethical committee, and University of Virginia. All participants provided written informed consent. The study was conducted in accordance with the principles set forth in the Declaration of Helsinki. Descriptive analyses, simple frequencies, and the distribution of results were evaluated. Non-parametric independent Mann–Whitney U-tests were used to compare the levels of inflammatory mediators between groups. Among TB cases, longitudinal responses from baseline and week 4 of treatment were compared using the Wilcoxon-signed rank test. General discriminant analysis was used to build a model of inflammatory mediators including ALS results to improve the predictive ability for TB. The data were analyzed using Statistical Package for Social Science (Version 22.0, International Business Machines, Inc, Chicago, IL, USA), and graphs were drawn using GraphPad Prism6 (GraphPad Software, La Jolla, CA, USA). The Bonferroni correction was applied to a P-value of 0.05 to account for multiple testing; a P-value of 0.002 was considered significant in our analyses. Between January 2014 and May 2015, 125 participants were enrolled in the parent study; 94 (75%) had sufficient supernatant for analysis in this sub-study, including 73 TB cases and 21 hospitalized controls. Among the TB cases, 44 (60%) had drug-susceptible TB, 22 (30%) had MDR-TB, and 7 (10%) were clinically diagnosed. HIV co-infection was prevalent in 20 (27%) TB cases, 14 (70%) of whom were on anti-retroviral treatment. Among all study participants, four were known to have diabetes and were receiving diabetes treatment, three (75%) of whom were hospitalized controls. Additional demographic details are displayed in Table 1. Abbreviations: BMI, body mass index; DST, drug susceptible testing; NA, not applicable. Note: All TB cases – this includes microbiologically confirmed cases (n=66) and clinically diagnosed cases (n=7). Abbreviations: NPV, negative predictive values; PPV, positive predictive values; ALS, antibody in lymphocyte supernatant; TNF-α, tumor necrosis factor-alpha; VEGF, vascular endothelial growth factor; TB, tuberculosis. Participants with TB had significantly lower levels of IL-1ra (P=0.001), IL-1β (P=0.002) (Figure 1B), and GM-CSF (P=0.002) (Figure 1C). MIP-1β (P=0.119), G-CSF (P=0.063), MIP-1α (P=0.067), and IP-10 (P=0.026) were low when compared to hospitalized controls but not significant. Most mediators did not show a significant difference. Median values among TB cases did not significantly differ by HIV status (data not shown). Figure 1 Unstimulated PBMC cytokine responses among TB cases and controls. Notes: (A–F): TB cases are shown in green and hospitalized controls in red. Data presented in log10 pg/mL. The figures are arranged depending on their scale, from the highest scale (A), consecutively to the lowest scale (F). Lines show the median with interquartile ranges. Mann–Whitney U test was used for comparison between groups. Bonferroni correction was applied, and a P-value of 0.002 was considered significant. Abbreviations: FGF-basic, fibroblast growth factor-basic; G-CSF, granulocyte-colony stimulating factor; GM-CSF, granulocyte macrophage-colony stimulating factor; IFN-γ, interferon-gamma; MCP-1, monocyte chemoattractant protein-1; MIP-1α, monocyte inducible protein-1α; MIP-1β, monocyte inducible protein-1β; PBMC, peripheral blood mononuclear cell; PDGF-bb, platelet-derived growth factor-bb; TB, tuberculosis; TNF-α, tumor necrosis factor-alpha; VEGF, vascular endothelial growth factor. In the longitudinal comparison of responses of inflammatory mediators among participants with TB, most did not show any significant change over time. The only inflammatory mediator that significantly changed over time was fibroblast growth factor-basic (FGF-basic), which showed an increase after 4 weeks of TB treatment when compared to baseline levels (P=0.002) (Figure 2). Figure 2 Comparison of cytokine levels among TB cases before and after 4 weeks of TB treatment. Notes: Figures depicting the longitudinal changes of cytokine, chemokine, and growth factor expression among TB cases, n=73. Concentrations are shown at baseline and at week 4 of treatment and results are expressed as Log10 pg/mL. Statistical analyses were performed using non-parametric Wilcoxon paired test and a P=0.002 was considered significant. FGF-basic significantly increased over time (P=0.002). Abbreviations: TNF-α, tumor necrosis factor-alpha; FGF-basic, fibroblast growth factor-basic; MCP-1, monocyte chemoattractant protein-1; TB, tuberculosis; TNF-α, tumor necrosis factor-alpha; VEGF, vascular endothelial growth factor. In this work, we compare the inflammatory mediator responses between TB patients and hospitalized controls using supernatants from PBMC cultures. Measuring secreted cellular byproducts from culture supernatants has shown potential, as evidenced by our work using ALS assays for the diagnosis of TB. We found that TB cases had significantly lower levels of the following inflammatory cytokines: IL-1ra, IL-1β, and GM-CSF. However, none of the measured mediators could improve upon the diagnostic accuracy of the ALS assay. Two pro-inflammatory cytokines were noted to be significantly different between our groups: IL-1β and GM-CSF. Because the untreated stage of TB typically prompts an avid inflammatory response, we had hypothesized that the pro-inflammatory cytokine should be found at higher concentrations in TB cases compared to the control population. However, we detected lower IL-1β levels among the TB group. IL-1β is produced by monocytes, macrophages, and dendritic cells and is down regulated by IL-1ra. Given the known antagonistic roles of IL-1β and IL-1ra,30,31 it is possible that the comparatively higher levels of IL-1ra seen within the TB group compared to IL-1β in the same TB group were influenced by the antagonistic relationship between IL-1β and IL-1ra. In our attempt to combine mediator responses with ALS results, we found that ALS was the strongest predictor for TB status. When used alone, ALS could categorize TB cases and hospitalized controls with a sensitivity of 92% and specificity of 96%;12 our optimal combination of mediators and ALS did not outperform this. Our study had limitations including the relatively short follow-up interval among TB cases (4 weeks) compared to the total duration of TB treatment. This may have hindered our ability to detect a longitudinal difference in mediator levels, especially among participants who had MDR-TB and may have experienced a slower immunologic response. Extended follow-up intervals could provide more insight into the trends of mediator levels. Some of our mediator responses exceeded the quantifiable range, which may have affected our ability to detect a true difference in levels between the groups. Serial dilution of the samples to obtain the actual reading could have mitigated this; however, this was not possible due to limited specimen volumes. Specimens used to conduct this study were also used for our first study examining the performance of the ALS assay. It is important to note that samples were not subjected to multiple freeze–thaw cycles and that storage conditions were the same for all specimens; therefore, we do not believe that mediator degradation could have differentially affected our results. In sum, few studies test unstimulated supernatant for mediator biomarkers to improve the diagnosis of TB. We found that the supernatant levels of IL-1ra, IL-1β, and GM-CSF could potentially be used to discriminate TB cases from hospitalized controls. These results may contribute to new mediator-based diagnostics for TB. We are grateful to the study participants and research staff who helped to make these important findings possible. NIH D43 TW008270 and D43 TW006578 NIH/Fogarty International Center Global Infectious Disease Research Training Program at UVA supported this work. MS is supported by COSTECH – Commission of Science and Technology, Tanzania and GIDRT fund through Centre of Global Health in UVA. NIH/NIAID K23-AI097197 supports TAT. All authors contributed to data analysis, drafting or revising the article, gave final approval of the version to be published, and agree to be accountable for all aspects of the work. Global Tuberculosis Report. Tuberculosis. 2017. Available from: http://apps.who.int/iris/bitstream/10665/259366/1/9789241565516-eng.pdf?ua=1. Accessed November 27, 2017. World Health Organization. End TB Strategy. 2015. Available from: https://www.who.int/tb/End_TB_brochure.pdf. Accessed November 27, 2017. Kozakiewicz L, Phuah J, Flynn J, Chan J. The role of B cells and humoral immunity in Mycobacterium tuberculosis infection. Adv Exp Med Biol. 2013;783:225–250. Wallis RS, Pai M, Menzies D, et al. Biomarkers and diagnostics for tuberculosis: progress, needs, and translation into practice. Lancet. 2010;375(9729):1920–1937. Raqib R, Rahman J, Kamaluddin AK, et al. Rapid diagnosis of active tuberculosis by detecting antibodies from lymphocyte secretions. J Infect Dis. 2003;188(3):364–370. Ashenafi S, Aderaye G, Zewdie M, et al. BCG-specific IgG-secreting peripheral plasmablasts as a potential biomarker of active tuberculosis in HIV negative and HIV positive patients. Thorax. 2013;68(3):269–276. Rekha RS, Kamal SM, Andersen P, et al. Validation of the ALS assay in adult patients with culture confirmed pulmonary tuberculosis. PLoS One. 2011;6(1):e16425. Raqib R, Kamal SM, Rahman MJ, et al. Use of antibodies in lymphocyte secretions for detection of subclinical tuberculosis infection in asymptomatic contacts. Clin Diagn Lab Immunol. 2004;11(6):1022–1027. Raqib R, Mondal D, Karim MA, et al. Detection of antibodies secreted from circulating Mycobacterium tuberculosis-specific plasma cells in the diagnosis of pediatric tuberculosis. Clin Vaccine Immunol. 2009;16(4):521–527. Thomas T, Brighenti S, Andersson J, Sack D, Raqib R. A new potential biomarker for childhood tuberculosis. Thorax. 2011;66(8):727–729. Sariko M, Anderson C, Mujaga BS, et al. Evaluation of the antibody in lymphocyte supernatant assay to detect active tuberculosis. PLoS One. 2017;12(1):e0169118–13. Scapigliati G, Buonocore F, Mazzini M. Biological activity of cytokines: an evolutionary perspective. Curr Pharm Des. 2014;2006(12):3071–3081. Oppmann B, Lesley R, Blom B, et al. Novel p19 protein engages IL-12p40 to form a cytokine, IL-23, with biological activities similar as well as distinct from IL-12. Immunity. 2000;13(5):715–725. Seder RA, Gazzinelli R, Sher A, Paul WE. Interleukin 12 acts directly on CD4+ T cells to enhance priming for interferon gamma production and diminishes interleukin 4 inhibition of such priming. Proc Natl Acad Sci U S A. 1993;90(21):10188–10192. Cooper AM. Cell-mediated immune responses in tuberculosis. Annu Rev Immunol. 2009;27(1):393–422. Kang DD, Lin Y, Moreno JR, Randall TD, Khader SA. Profiling early lung immune responses in the mouse model of tuberculosis. PLoS One. 2011;6(1):e16161. Cepheid®. Xpert® MTB/RIF Package Insert Ref GXMTB/RIF-US-10. 2015. Available from: http://www.cepheid.com/us/cepheid-solutions/clinical-ivd-tests/critical-infectious-diseases/xpert-mtb-rif. Accessed October 12, 2018. National Tuberculosis and Leprosy Programme. Manual for the Management of TB and Leprosy 2013-2017; 2012. Available from: https://moh.gov.gm/sites/default/files Final_TB_Manual_2013-2017%5B1%5D_0.pdf/. Accessed November 28, 2017. Mpagama SG, Mtabho C, Mwaigwisya S, et al. Comparison of overnight pooled and standard sputum collection method for patients with suspected pulmonary tuberculosis in northern Tanzania. Tuberc Res Treat. 2012;2012(128057):1–5. Palomino JC, Martin A, Portaels F. Evaluation of automated BACTEC MGIT 960 system for testing susceptibility of TB. J Clin Microbiol. 2007;37(3):607–610. Cheknev SB, Apresova MA, Moryakova NA, et al. Production of the growth factors GM-CSF, G-CSF, and VEGF by human peripheral blood cells induced with metal complexes of human serum γ -globulin formed with copper or zinc ions. Mediators Inflamm. 2014;2014:518265–8. Instruction Manual. Bio-Plex Pro TM Human Cytokine, Chemokine, and Growth Factor Assays. Hercules, CA: Bio-Rad Laboratories, Inc.; 2009:1–47. Romero-Adrian TB, Leal-Montiel J, Valecillo A. Role of cytokines and other factors involved in the Mycobacterium tuberculosis infection. World J Immunol. 2015;5(1):16. Maglione PJ, Xu J, Chan J. B cells moderate inflammatory progression and enhance bacterial containment upon pulmonary challenge with Mycobacterium tuberculosis. J Immunol. 2007;178(11):7222–7234. Wan YY, Flavell RA. How diverse--CD4 effector T cells and their functions. J Mol Cell Biol. 2009;1(1):20–36. Surcel H-M, Troye-Blomberg M, Pauliet S, et al. Thl/Th2 profiles in tuberculosis, based on the proliferation and cytokine response of blood lymphocytes to mycobacterial antigens. Immunology. 1994;81(2);171–176. Shen H, Chen ZW. The crucial roles of Th17-related cytokines/signal pathways in M. tuberculosis infection. Cell Mol Immunol. 2018;15(3):216–225. Lee JH, Chang JH. Changes of plasma interleukin-1 receptor antagonist, interleukin-8 and other serologic markers during chemotherapy in patients with active pulmonary tuberculosis. Korean J Intern Med. 2003;18(3):138–145. Sasindran SJ, Torrelles JB. Mycobacterium tuberculosis infection and inflammation: what is beneficial for the host and for the bacterium? Front Microbiol. 2011;2:1–16. Dinarello CA. Biologic Basis for Interleukin-l in Disease. Blood. 1996;87(6):2095–2147. Szeliga J, Daniel DS, Yang CH, Sever-Chroneos Z, Jagannath C, Chroneos ZC. Granulocyte-macrophage colony stimulating factor-mediated innate responses in tuberculosis. Tuberculosis (Edinb). 2008;88(1):7–20. Cho JE, Park S, Lee H, Cho SN, Kim YS. 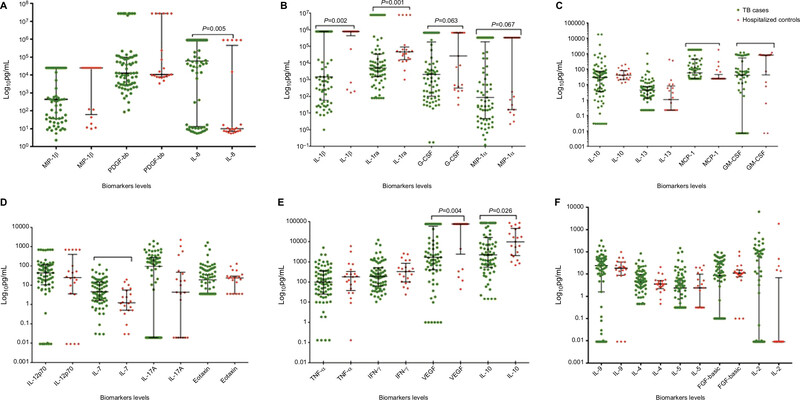 Mycobacterium tuberculosis-induced expression of granulocyte-macrophage colony stimulating factor is mediated by PI3-K/MEK1/p38 MAPK signaling pathway. BMB Rep. 2013;46(4):213–218. Xiong W, Dong H, Wang J, et al. Analysis of plasma cytokine and chemokine profiles in patients with and without tuberculosis by liquid array-based multiplexed immunoassays. PLoS One. 2016;11(2):e0148885. Ehlers S. Role of tumour necrosis factor (TNF) in host defence against tuberculosis: implications for immunotherapies targeting TNF. Ann Rheum Dis. 2003;62(Suppl 2):37ii–42. Harris J, Keane J. How tumour necrosis factor blockers interfere with tuberculosis immunity. Clin Exp Immunol. 2010;161(1):9. Wergeland I, Pullar N, Assmus J, et al. IP-10 differentiates between active and latent tuberculosis irrespective of HIV status and declines during therapy. J Infect. 2015;70(4):381–391. Wergeland I, Assmus J, Dyrhol-Riise AM. Cytokine patterns in tuberculosis infection; IL-1ra, IL-2 and IP-10 differentiate borderline QuantiFERON-TB samples from uninfected controls. PLoS One. 2016;11(9):e0163848. Henke C, Marineili W, Jessurun J, et al. Macrophage production of basic fibroblast growth factor in the fibroproliferative disorder of alveolar fibrosis after lung injury. Am J Pathol. 1993;143(4):1189–1199. Awoniyi DO, Teuchert A, Sutherland JS, et al. Evaluation of cytokine responses against novel Mtb antigens as diagnostic markers for TB disease. J Infect. 2016;73(3):219–230. Anbarasu D, Raja CP, Raja A. Multiplex analysis of cytokines/chemokines as biomarkers that differentiate healthy contacts from tuberculosis patients in high endemic settings. Cytokine. 2013;61(3):747–754. Riou C, Perez Peixoto B, Roberts L, et al. Effect of standard tuberculosis treatment on plasma cytokine levels in patients with active pulmonary tuberculosis. PLoS One. 2012;7(5):e36886.